Ibrahim Khalil Jewel: Baby’s safety is a big concern over the world. Every parent wants to make his/her baby happy and smiling one. Keeping children of all ages safe and healthy is one of the most important tasks of a parent or child care providers. Babies should be prepared to prevent injuries or hurting. “Dmark” is a China-based metal button and button attaching machine manufacturer, whose main focus on safety for babies; so that kids are not being hurt or feel any discomfort while they wear any dress. Dmark Metal Button Co. Ltd is being operated globally having offices in different countries like USA, Canada, UK, Bangladesh, India, Cambodia, Hong Kong, along with the Head Quarter in China. Beside its quality products, Dmark introduces their Button Attaching Machines with Safety Monitoring System named “BABY SAFE” to their customers to enhance the product safety of babies wear. 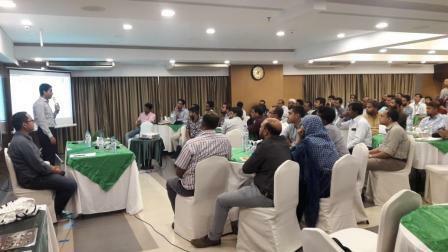 The above information was expressed in a seminar titled “Seminar on Baby Safe Attachment Control System” organized by Dmark Metal Button Co. Ltd, Dhaka office at Platinum Grand Hotel, Banani, Dhaka on 6 November, 2018. Md. 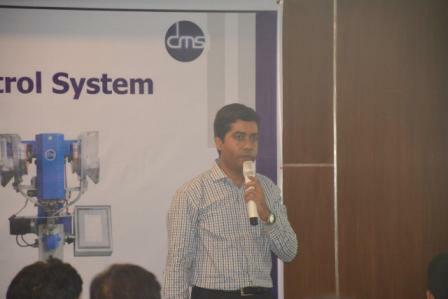 Monzurul Hoque, Country Director, Dmark Metal Button Co. Ltd spoke as the main speaker in the seminar and had given a lively presentation highlighting the features, quality & competitiveness of all the products of Dmark. Mr. Piseth Orn, Technical Service Supervisor and Robiul Karim, Asst. Manager of Dmark were also present. More than 100 participants from different garment factories spontaneously took participation in the seminar. At the end of the seminar, the Question & Answer session was also very participatory and live. He also informed that they are providing button attaching machines to the apparel manufacturers who are using their buttons. The benefits of “BABY SAFE” attaching machine are: No inappropriate foundation; No fault attachment; Transparent operation; Stop attachment immediately upon detected defects; Avoid overlooking of any defects due to inevitable tiredness of human being; Save resources; Stop hurting baby. 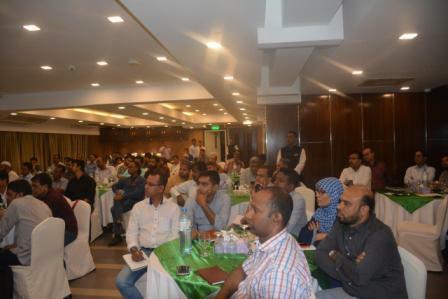 By using Damrk products and button attaching machines, Garment company owners can reduce manpower, that must be cost effective and simultaneously it increases product safety rate, Monzurul Hoque told the seminar. “Our machines main functions are, it can detect Prong Leg In, Leg Out, Uneven Fabric Detection, Materials Protection System by maintaining Alert System. All are very important to ensure Babies safety. Only Dmark is providing these facilities in Garments industry,” Mr. Monzurul added. He told, as the baby safety is ensured, adult safety obviously be ensured. It is worth mentioning here that the kids wear fashion market is booming with time beside adult wear. The global kids wear market ranked up sales of € 135.6 billion in 2015, up from € 122.1 billion in 2010, and estimated to reach a value of of €162.7 billion by 2018 according to Euromonitor International. According to Bangladesh Garment Manufacturers and Exporters Association (BGMEA) research data, the export of baby garments marked a significant rise by 25% in the last five months of the previous fiscal year. By estimating we can say that the kids wear business in Bangladesh will remain undoubtedly good in future. Dmark is focusing Bangladesh to capture Children wear business beside adult wear. “We use DM 1020 production management system, which is a tailor-make and developed by ourselves, with the system we manufacture the products for all-round quality inspection and tracking. This system is created according to DMARK’s own characteristics, which founded after customer modification & improvement. In the production process of inspection, final inspection, Dmark using three-dimensional visual inspection system, to achieve 100% full-size inspection, accuracy surface check, automatic color difference check, “Good” product for packing and “Not Good” product classification and separated. This process replace the old method inspection, eliminating the uncertainty caused by manual inspection, accuracy and stability greatly improved. Mr. Monzurul said: Dmark is providing a complete package of quality button and ensuring garments safety which is very important for global market.